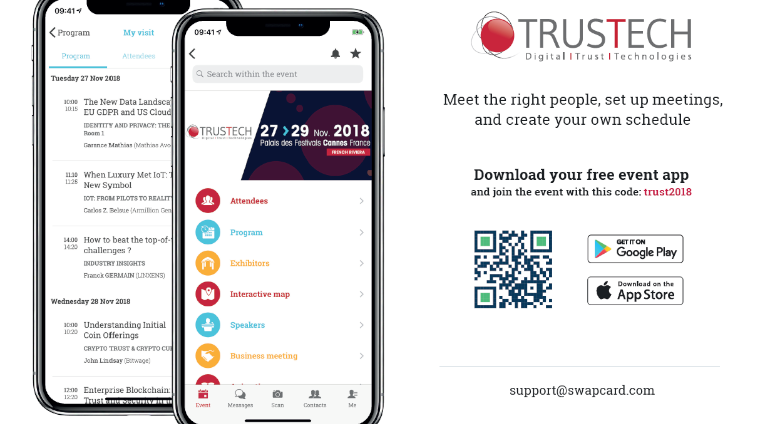 TRUSTECH is the official App for TRUSTECH 2018, the leading event for digital trust technologies which will take place at the Palais des Festivals in Cannes France, from 27th November to 29th November 2018. The 2018 mobile app has been redesigned to increase opportunities for qualitative business meetings between participants. The mobile app features all the TRUSTECH participants (visitors, exhibitors, speakers, journalists) and is available for free. Fill in your profile, participants will contact you. Consult the event’s participant list and use filters to target the best contacts for you. Browse our meeting suggestions based on your interests and expectations. Chat with the most interesting persons and urn this first contact into a face-to-face meeting during the event. Develop your business and your network. See the full conference program and the speaker list. Navigate on the event's interactive floor plan and the list of exhibitors. Get the description of the events within the event. Find useful information with our Twitter feeds @TRUSTECH_Event and onsite services (Transportation, catering, etc.). Your favorites listing in the "My Visit" section. Access to the matchmaking module.